Citizens who have an idea for using open data are invited to submit their entries for the Open Data Day challenge. The Northern Cape Department of Economic Development and Tourism in partnership with the Open Government Partnership South Africa (OGP SA), Geekulcha and Diamond Creative Vision Hub are calling IT enthusiasts of all ages to submit their entries for the fifth edition of the International Open Data Day challenge. According to Geekulcha, International Open Data Day is a gathering of citizens in cities around the world to write applications, utilise data and create data visualisations using open public data supplied by the local municipality. The event, set to take place on the 4 March, hopes to bring together IT students and professionals, creative designers, fin tech entrepreneurs, innovators and developers under one roof. The aim of the challenge, adds the youth IT organisation, is to encourage developers, designers, researchers and entrepreneurs to use available open data, also sourced from the Open Data for Africa Web site, to develop applications, stories and visualisations that can help residents work better with local government and seek solutions to existing social challenges, using open data, while encouraging the adoption of open data policies by the world's local, regional and national governments. The theme this year, he continues, will be premised on four key areas which can be resolved by open data, such as open research data, tracking public money flows, open data for environment, and pen data for human rights. 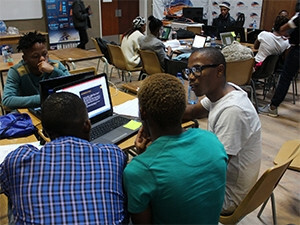 The event, which will take place in Kathu, the iron ore capital of the Northern Cape, will be packed with a line-up of other activities which include ICT workshops, business development sessions, data hunting, data visualisations talks, project management skills development presentations for entrepreneurs facilitated by Google SA and industry experts. Gomolemo Motlhwai, coordinator at the Northern Cape Department of Economic Development and Tourism, believes there is a need to bring exciting programmes to encourage citizens, especially the youth, to be passionate about science and technology. "A first step in building a smart and a vibrant economy is to instil and drive digital literacy to the people. The event will drive digital education in the province through ICT, innovation and entrepreneurship-aligned programmes. Open Data has been identified as one of the key stimulates in building digital skills and smart citizenship." Previously, the province had hosted the Responsive Cities Challenge where a water crisis in the city was addressed through the use of an open data project created by local innovators.